Is Loratadine Safe While Breastfeeding? Does Loratadine Impact Nursing Infant? Sera was down with a cold and fever. She could not take any medicine due to the fear that it would adversely affect her nursing baby. But when over-the-counter (OTC) drugs such as loratadine (Claritin) are handy, how could she simply suffer? Then she did something admirable. Before buying the drug, she did a ‘background check’ to get an answer to the question, “can I take claritin while breastfeeding”. Seasonal allergies are quite irritating, particularly when you are breastfeeding a baby. However, you need not have to stay away from medication. Instead, make an effort to know if that drug would harm you or your baby in any way. In this post, MomJunction helps you know if loratadine is safe or it will enter your breast milk and harm the baby. Loratadine is an OTC drug that temporarily treats allergic (hay fever and others) symptoms such as watery eyes, itchy throat, eyes or nose, sneezing and a runny nose. It is also used to treat symptoms of hives, including itching and reddening of the skin. However, Loratadine doesn’t prevent hives or other allergic skin reactions (1). Loratadine is an antihistamine. Histamine is a chemical produced by the body when it encounters an allergen, be it dust mites, pollen or any other substance. Histamines lead to various allergic reactions. Antihistamine-class of drugs block the histamine action in the body and provide relief to the user. Loratadine is available in the form of a liquid, capsule, tablet and disintegrating tablets. 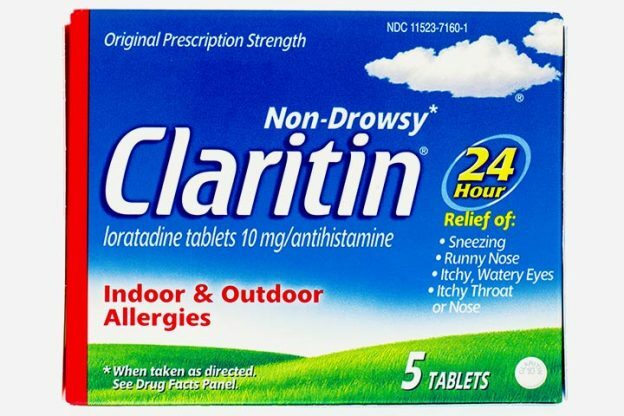 Claritin is the most common brand of loratadine. It is also available as store-brand and off-brand medication. Some other brand names of loratadine are Alavert, Wal-itin, Dimetapp ND and Tavist. Yes, it is safe but within limits. As per the recommendations of the British Society for Allergy and Clinical Immunology’s, loratadine can be taken at its lowest dose during breastfeeding (2). Loratadine passes into the breast milk in low amount but has no sedative effect. The ingredients of Claritin and Claritin-D are safe while breastfeeding. However, the doctor may not recommend loratadine during breastfeeding if the baby has low birth weight, was born prematurely or has health issues (3). Your health condition is important too: If you have liver or kidney disease, inform about it to the physician before he prescribes the medication. Even if you and your baby do not have any health conditions, you have to limit your intake of loratadine to small amounts as it enters the breast milk. How Much Loratadine Does Breast Milk Absorb? Six women were studied to understand the impact. When they took a single oral dose of 40mg, average peak milk level of 29.2mcg/L occurred two hours after the dose was taken. Desloratadine is a major metabolite of loratadine. At 5.3 hours after the dose, 16mcg/L desloratadine occurred in peak level in milk. Over 48-hour time, a total of 11.7mcg of loratadine and its metabolite were excreted in the milk. However, the dose taken by the women was four times more than the usual dose. And thus, with 10mg dose, a total dose of 3mcg would be expected (4) in the breast milk. The little amount of the drug that seeps into your breast milk may not have any adverse effects. But higher doses can prove to be troublesome. If antihistamines are taken in relatively higher doses, the basal serum prolactin could decrease in non-lactating women and early postpartum women. But antihistamines do not affect the suckling-induced prolactin secretion. So, in a mother with established lactation, prolactin levels may not affect her breastfeeding ability (5). In another study, one out of 51 nursing mothers, who were on 10mg loratadine for less than a week at four months postpartum, reported a decrease in the milk production. There is no research to say that Claritin dries up or reduces breast milk. Drugs.com suggests Desloratadine and Fexofenadine as alternatives to Claritin. If you notice any decrease in lactation while on Loratadine, talk to your doctor. Note: Claritin-D has the decongestant pseudoephedrine, which is categorized as ‘moderately safe’ during lactation (6). According to a survey conducted by Teratogen Information Service on 51 nursing mothers, who were on loratadine and had infants over two months old, two mothers reported minor sedation in their babies. These mothers were on the medication for one week or less and took a dose of 10mg each day. Other developments in babies, such as psychomotor skills and weight gain, were on par with the other infants in the control group, who were not exposed to the drug. In an extension of the study, the researchers did not find differences in sedation or any other side effects in the infants of the mothers who took loratadine and those who did not (7). It is a good idea to observe your baby while you are on this medication. Check if your little one displays symptoms like a rash or noticeable changes in her behavior such as heightened fussiness or irritability or sudden changes in her appetite or sleeping pattern. On the bottom line, loratadine is safe to use while breastfeeding. But, try harmless remedies such as steam inhalation or anti-inflammatory herbs. If your doctor prescribes loratadine while breastfeeding, keep a watch on the side effects. Ask your doctor about the best time to take loratadine. For instance, you can take it just after nursing your baby to minimize her exposure to the drug. Did you suffer from any allergies when you were breastfeeding? How did you overcome them? Share your experiences in the comment section. Is Fexofenadine Safe While Breastfeeding? Is It Safe To Take Wellbutrin When Breastfeeding? Is It Safe To Take Antibiotics While Breastfeeding? Is It Safe To Take Sleeping Pills While Breastfeeding? How To Treat Hives While You Are Breastfeeding?